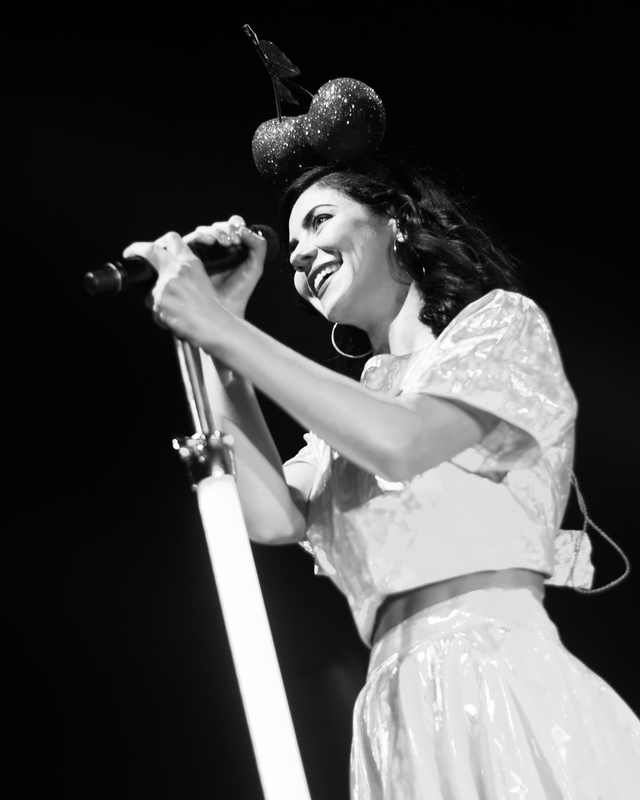 I first saw Marina & The Diamonds perform back in 2009 while warming-up for Paulo Nuttini at London’s iTunes Festival. Even then you could see she had the makings of a star. There was something distinct about both her music and performance which made her stand out. She had a confident and acute self-awareness of her talent which helped to add a subtle gravitas to her presence. 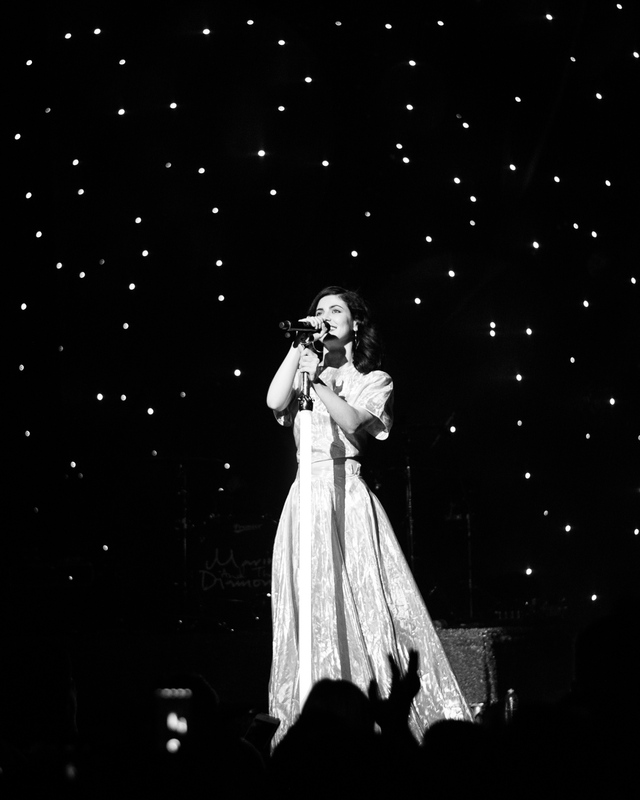 Fast-Forward six years and Marina & The Diamonds performed to a sold out Warfield in San Francisco and it was a dazzling performance. She hit the stage with force wearing a glorious reflective silver dress which shone like a diamond when it caught the light (this helping the dazzle). This was matched with a diamante cherry headband (her latest album is called Froot after-all). Spinning around the stage as her powerful voice, every bit distinctive as it was before just more refined sucked in the youthful crowd. Forget was a chance to let go and then she dropped one of my all time favourites, Mowgli’s Road. Making a point to include quite a few of her older songs was a nice touch. I Am Not A Robot and Obsessions were both performed early on as well. 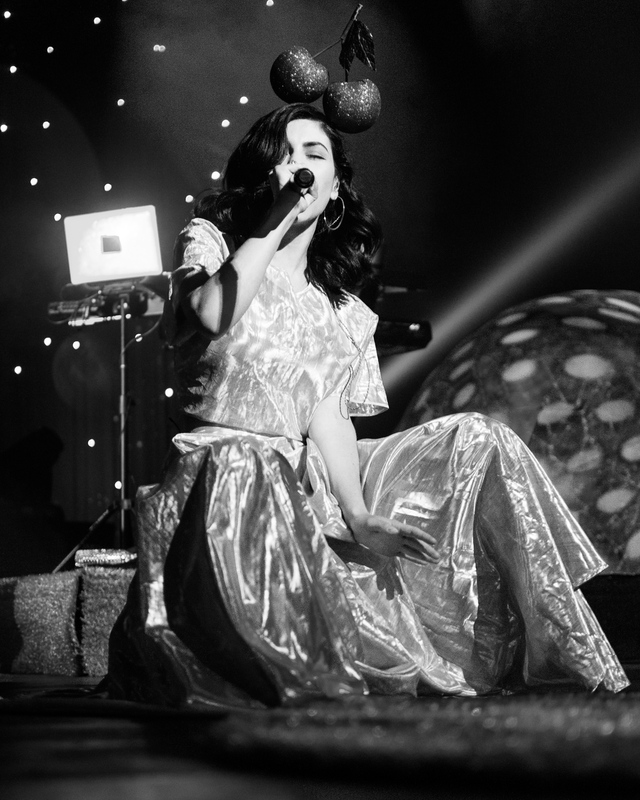 Marina was determined to make use of as much of the Warfield stage as she could and make herself at home; kneeling down, sitting on the edge – anyway possible to represent and channel the music she was performing. If her heels were a little more forgiving I am sure she would have been jumping as high as LeBron! It was nice to see her settle down behind the keyboard for a moment of calm to sing Happy, an anthemic introspective song from her latest album. If Happy received a rapturous cheer during its first few chords, then the reception for the next song Can’t Hold Me Down (also from Froot) was almighty! Strange observation, I really loved the high-hats on it, they really seemed to just spin off the beat. Unfortunately I had to leave soon after (life sometimes happens). 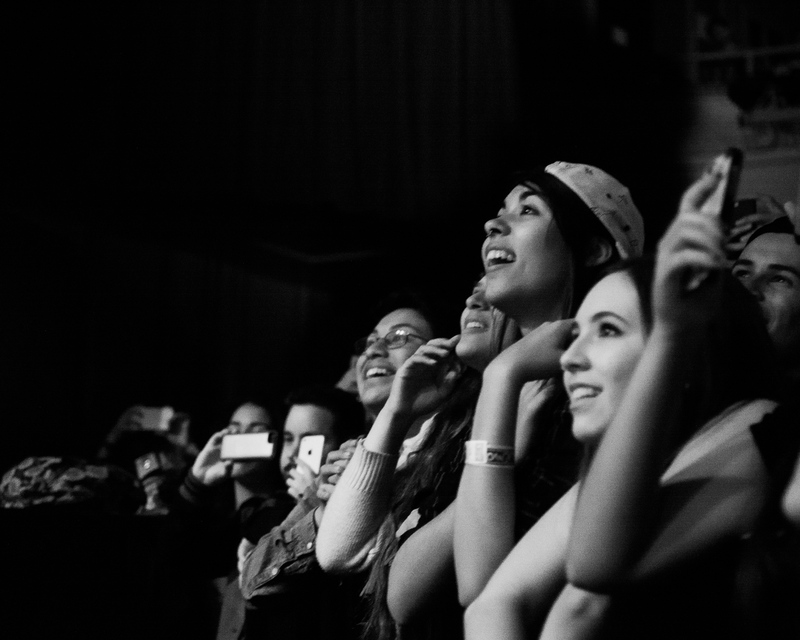 That said, and even though the gig continued, if she had ended it when I left I would have been thoroughly satisfied. Mid-set, she said she loved San Francisco, that it is her spiritual home. Granted, she may say that everywhere, still, we’d be more than happy for her to visit home more often… ey Marina, what you up to Thanksgiving? Ps. Gorgeous dress, bloody hard to photograph! 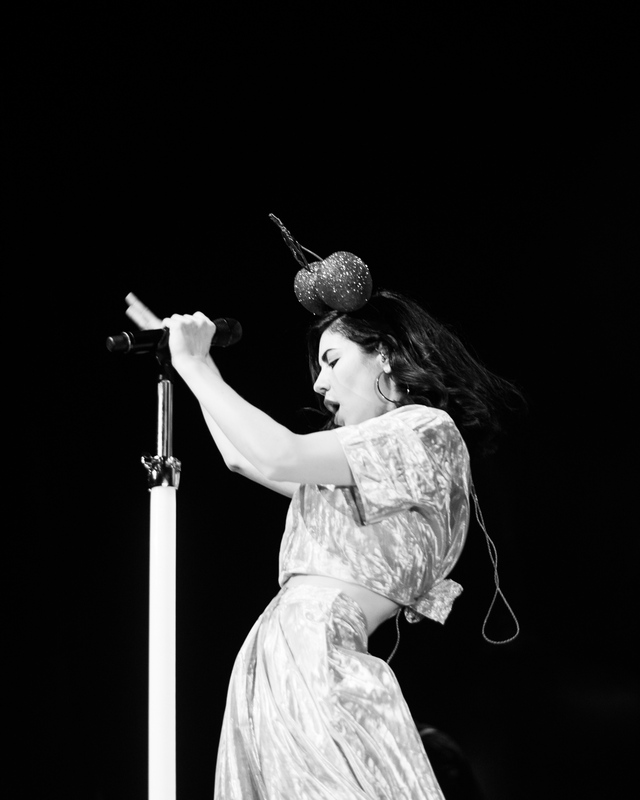 Posted in Gig Photos, Gig Reviews, Music Photography, PhotographyTagged Concert, Froot, Marina & The Diamonds, music photography, Photography, San Francisco, The WarfieldBookmark the permalink. Great commentary… I too attended the concert. I think its important to add that this concert was intended as a small promo show, its not apart of her Neon Forest Tour, which i will expect more theatrics and costume changes. The moment she performed “Happy” on a keyboard was EVERYTHING! Incredible distinctive voice with beauty, grace, and personality. Also, I thought she made the best setlist, considering she only did 15 songs. That’s fascinating if that was just a small promo show! A fifteen song set is a solid one by any standard, especially as it spanned all her albums.